Is Zoom! Teeth Whitening Worth It? If you ask your local dentist what the most popular cosmetic dentistry treatment is, they’ll likely tell you teeth whitening. In fact, you don’t even have to ask your dentist. Instead, take a trip to your local pharmacy or grocery store and walk down the oral hygiene aisle. You’ll find hundreds of teeth whitening toothpastes, mouthwashes, strips, and gels that all promise to deliver dramatically brighter smiles. Unfortunately, these products are not able to deliver on their promises, and most patients end up visiting a dentist for professional teeth whitening. Skip the store bought whiteners and trust your smile to a qualified dentist for predictable, effective Zoom! teeth whitening. There are actually two reasons that store bought whiteners are not able to deliver the results patients hope for. The first is that the Food and Drug Administration (FDA) closely monitors the dosage of whitening agent, and the very small dose of active whitener would need to be reapplied several times a day for weeks to achieve even minimal brightening. Additionally, the application methods are not effective. They allow the neutralizing saliva to immediately access the whitening gel and stop the stain removal process in just seconds. Additionally, even the gentlest teeth whitener can irritate or damage the soft tissue. Professional take-home whitening kits address these two concerns with store bought whiteners. The active whitening agent is provided in personalized doses that will achieve predictable results. These personalized teeth whitening doses are applied using custom crafted whitening trays. These application trays are customized to seal whitening gel onto the surfaces of teeth and prevent the whitener from accessing soft tissue. Patients will need to use their whitening gel for about thirty minutes at a time for about two weeks. At the end of the two weeks of daily application, patients will achieve smiles up to ten shades brighter. These personalized professional take-home whitening kits are great for patients with sensitive teeth and those who want to brighten their smiles gradually. Patients who want quicker results, should consider in-office professional whitening. Zoom2 is the latest version of the Zoom! teeth whitening brand. This in-office whitening method can deliver smiles up to ten shades brighter in just one visit. The process is simple, we protect soft tissue by placing plastic shields. Then, we apply a coat of whitening gel. 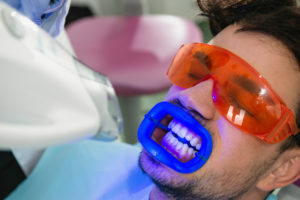 The Zoom2 system also uses low-heat lights to activate the whitening gel. We apply that light to the smile while the whitening gel is in place and allow the Zoom2 system to work for about 20 minutes. We check the results every twenty minutes and reapply as necessary until you achieve the desired end result. At San Antonio’s New Image Dentistry, we are passionate about helping our patients fall in love with their smiles. If you’re interested in a brighter smile, contact our office to schedule a cosmetic dentistry consultation. We’ll evaluate your condition, answer your questions, outline your treatment options, and help you create a personalized smile make over plan that will meet your needs. If you have deeper set staining that will not be responsive to traditional teeth whitening methods, we also offer a variety of other treatment options to perfect your smile. Our San Antonio dentist and dentistry team look forward to seeing you and your loved ones soon. Comments Off on Is Zoom! Teeth Whitening Worth It?